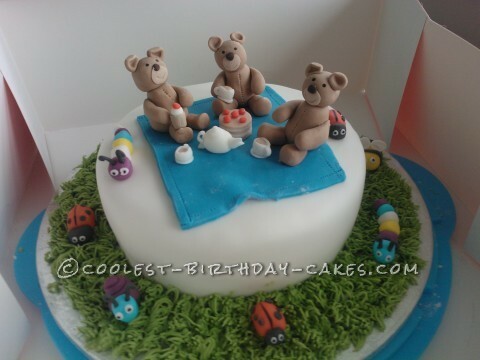 I made this Teddy Bears Picnic cake after seeing a picture similar and liked it. The grass is piped icing using nozzle number 233. The bears and creatures are made using a mix of 50/50 sugar paste and flower paste. I created a blanket for them to sit on and food. To make the bear heads, take a small piece of icing and roll into a ball. Then take a larger piece and roll another ball and tease into an egg shape. Roll another smaller ball and cut in half, this is for the arms. Roll two small sausages from the halves and use light pressure on one end of each to make them taper. To make the legs roll two fatter sausages and flatten one end to make paws. For the ears make two small balls and use the small end of your ball tool to make indentations. Cut a small circle for the face. Use a small dark brown piece for the nose and paint on the eyes. Stick all pieces together using edible glue and a cocktail stick to attach the head. I then make a little teapot and cups using sugar paste to finish it off. Brilliant outcome and enjoyed by all who saw it. How did you make the Chewbacca round like a ball?